This shade is the same shape and design as the popular Aladdin Lamps Crystal Rose shades, just without the hand-painted flowers. A beautifully shaped shade, it compliments the Short Lincoln Drape table lamps as well as many other Aladdin and Central Draft style Table Lamps. The center of this shade is clear glass, allowing a large amount of light through, while still providing a warm glow from the frosted areas. American Made, Hand Blown Glass. 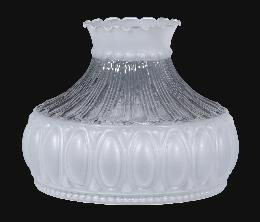 This Crystal Rose style shade has a 10" base fitter, and uses an Aladdin or BP 10" Shade Ring. 8 1/2" tall, with a 11 1/4" bulge.